Do you think you have the names of Santa Clause's magical flying reindeer memorized? Go ahead, try listing them off now. We'll wait . . . . Did you get them all right? Let's check: In the original 1823 poem "A Visit from St. Nicholas" (also known as " 'Twas the Night Before Christmas," Clement Clarke Moore said that Santa (St. Nick) "call'd them by name: 'Now, Dasher! Now, Dancer! Now, Prancer, and Vixen! On, Comet! On, Cupid! On, Dunder and Blixem!' " The original poem uses the Dutch spelling of "Dunder and Blixem," while in an American Anthology, 1787–1900, Edmund Clarence Stedman reprinted the poem using the then-current German spelling, "Donder and Blitzen" (the modern German spelling is "Donner,"). Either way, those last two Reindeers' names translate as "Thunder and Lightning," both of which are no stranger to being up in the sky. Yuletide aficionados will notice the distinct lack of Rudolph and his red shining nose, and not just because this isn't a color coin. Rudolph was introduced to the Christmas lexicon as a piece of Montgomery Ward marketing in 1939. The retail giant wanted to create a line of holiday-themed coloring books to peddle to kids, and the story of a spunky young outcast that saves Christmas was just the ticket. The coloring book sold millions of copies, many of which were probably opened by children on Christmas morning. Rudolph remains a Christmas icon to this day. 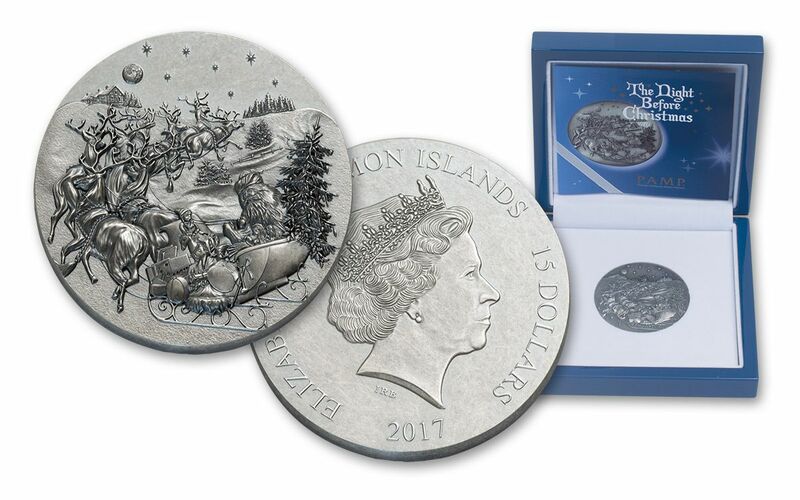 If you or a loved one would like to open this Solomon Islands 2017 5-oz Silver "The Night Before Christmas" Proof-Like coin on Christmas morning (or right when it arrives), don't wait -- order today! A LITTLE OLD DRIVER SO LIVELY AND QUICK-- The reverse features a magical nighttime winter scene of Santa Clause and his sleigh full of classic handmade toys coursing against a starry sky over a snow-covered landscape, drawn by his team of eight flying reindeer towards a house in the distance. The obverse features a profile of Queen Elizabeth II facing to the right, as well as the inscriptions "ELIZABETH II," "SOLOMON ISLANDS," "15 DOLLARS," and "2017" around the border. 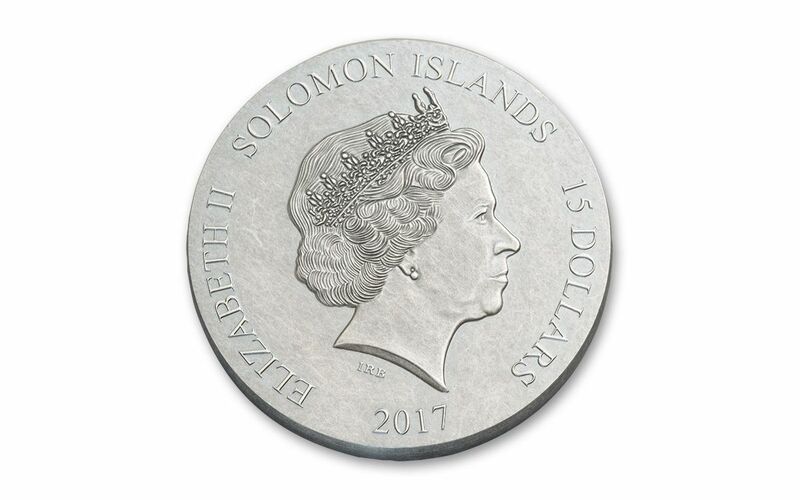 SOLOMON ISLANDS LEGAL TENDER-- Each 2017 5-oz Silver "The Night Before Christmas" Proof-Like coin is $15 Solomon Islands legal tender, a fact reflected on the obverse along with a profile portrait of Queen Elizabeth II. 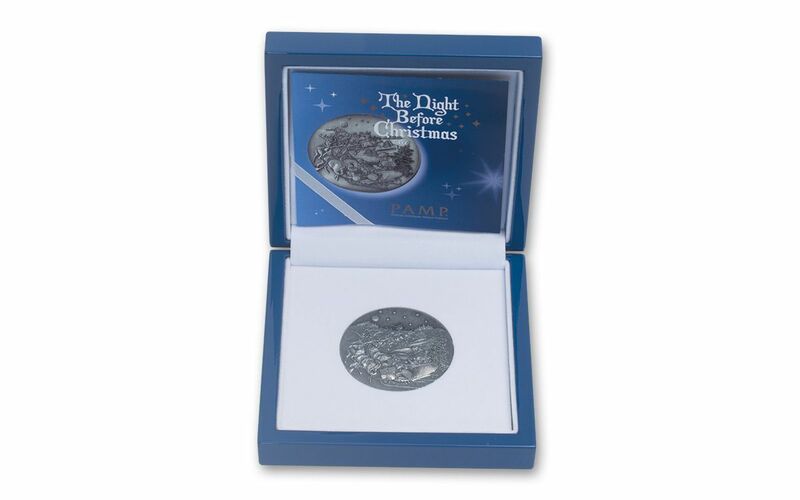 A GIFT WITHIN A GIFT -- Your Solomon Islands 2017 5-oz Silver "The Night Before Christmas" Proof-Like coin will come comfortably seated in an elegant glossy midnight-blue presentation box with its certificate of authenticity, as well as a copy of the nineteenth-century Clement Clarke Moore poem that inspired the coin. This merry conception of Santa Clause and his magical flying reindeer has enchanted us for generations. Children (of all ages) still have a place in their hearts for St. Nicholas and the joy he brings every Christmas. 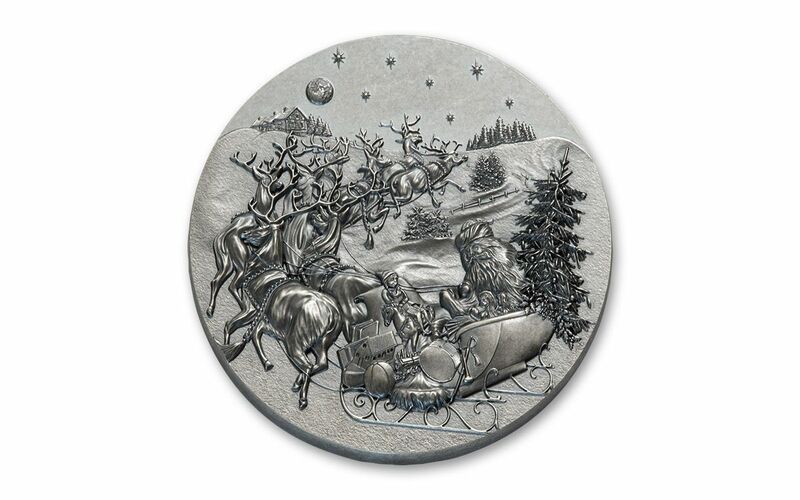 Santa's popularity will live on, but this Solomon Islands 2017 5-oz Silver The Night Before Christmas PF-Like coin will only be available while supplies last -- order today!